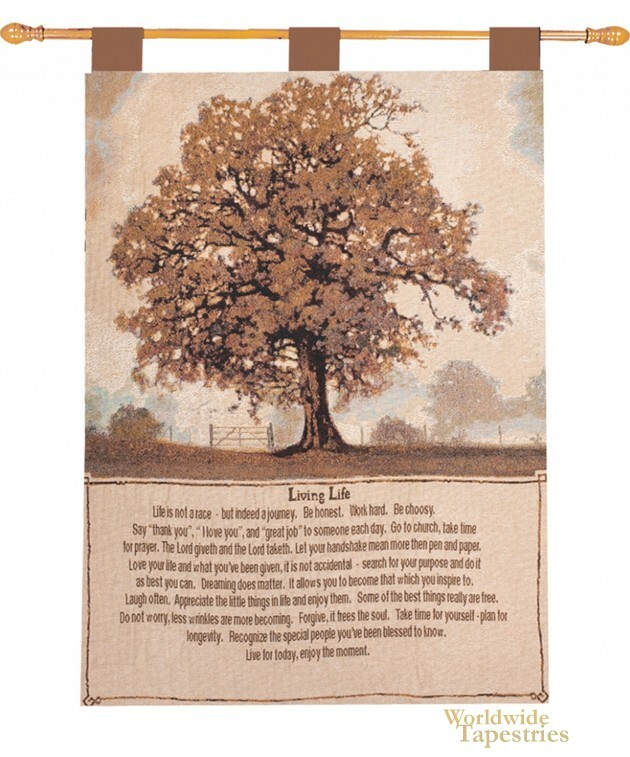 Living Life tapestry shows the work of Bonnie Mohr and includes an inspirational quote. The quote reads: Living Life, Life is not a race- but indeed a journey. Be honest. Work Hard. Be choosy. Say "thank you", and "great job" to someone each day. Go to church, take time for prayer. The Lord giveth and the Lord taketh. Let your handshake mean more than pen and paper. Love your life and what you've been given, it is not accidental. Search for your purpose and do it as best you can. Dreaming does matter. It allows you to become that which you aspire to. Laugh often." The piece shows a large tree in a park symbolising life and nature. This Christian tapestry is backed with a lining and a tunnel for easy hanging. Note: tapestry rods and tassels, where pictured, are not included in the price.